Can I Prevent People from Unsubscribing from My Newsletter? Is your Cerkl running internally and you're afraid Jerry from accounting is trying to shut off his newsletter settings? Not to worry, this is the setting for you. 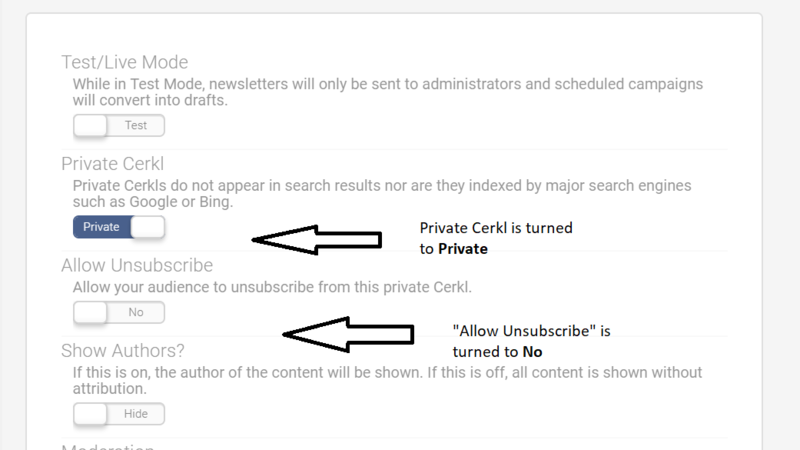 Only private Cerkls have the privilege to remove the unsubscribe option from a newsletter. Marking a Cerkl Private means that the Cerkl and its content will not be searchable on Google, Bing, or any other search engines. Only subscribers can access your Cerkl, so non-subscribers cannot manually subscribe. Also, any content produced within Cerkl (by using the Add Content feature) is not shareable on social media. Locate Private Cerkl and set it to Private. Locate Allow Unsubscribe and set it to No.